I'm offering my knowledge, experience and home to take care of your pets while your out of town. Your dog would be in a fun and loving environment with other dogs to play with. Many people don't like the idea of boarding their dog in a facility where they're in a kennel 24/7. 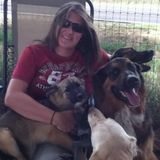 I have a lifetime of dog knowledge, and absolutely love helping dogs and owners with anything they may need. We take walks, go swimming, have play groups and more. Your dog will never have to be in a kennel unless she/he needs to be for her/his own safety when not supervised. Please let me know if you have any questions, or would like references. You can be assured your dog will be happy and enjoying his/herself while your away. I also send pic's of your dogs activity while your gone. Get a hold of me before I book up. I am Tia W and I am a teenager who needs to earn money to buy a car for when I'm older. Retired nurse and grandmother looking for a childcare position in SW Denver or Lakewood area.